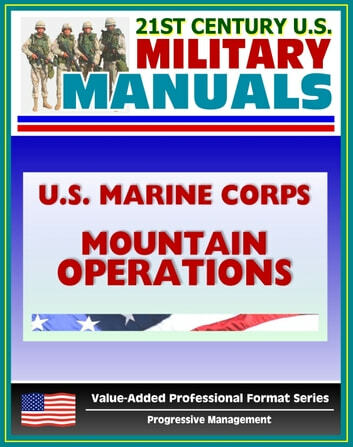 Part of our value-added professional format series of U.S. military manuals, this U.S. Marine Corps manual is a reference on tactics, techniques, and procedures for small unit leaders in the mountain environment. 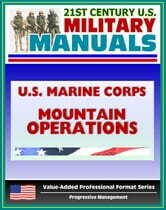 This publication explains the basics of how to deal with the unique conditions imposed when operating in mountainous terrain. While primarily aimed at infantry leaders from the company to fire team level, this publication is useful for small unit leaders of any ground combat element, combat support, combat service support, and aviation combat element units. Conventionally organized Marine Rifle Companies who are well trained in maneuver warfare are the ideal foundation from which to develop mountain troops. If every Marine receives additional training in basic mountaineering and selected individuals receive training in special skills, the company can be ready to fight and win in a mountainous environment. Most of the tactics applied in conventional warfare can be successfully employed in the mountains. The most important consideration and difference is the terrain, which has a tendency to require platoons and squads to act independently as the company moves into steeper and more rugged territory. Aggressive small unit leadership is key to success in the mountains. A Rifle Company has many of the assets it needs to be successful during combat operations in the mountains. Light, quick, and mobile, a company can use speed and maneuver to surprise the enemy. In order to overcome many of the obstacles prevalent in the mountains, units will often need to temporarily reorganize themselves to allow specially trained Marines to tackle obstacles, while the rest of the unit provides security or carries out other missions. Such obstacles are cliffs, steep earth, rivers and gorges. Summer Mountain Leaders and Assault Climbers are trained to overcome all of these obstacles and Tactical Rope Suspension Technicians are trained to overcome the last two. All Marines need to be trained in the skills of the Military Mountaineer prior to deployment to a mountainous battlefield.